Pine tree by Safari Ltd.
I’ve found that Safari Ltd. offers a pine tree which looks very nice (on photos). At least better than Schleich fir trees. It measures 10x17 cm and costs not so much – about $12. Now I desperately want to order it to my friend that is going to Florida, but I don’t want to judge only by photos. What if in real life this pine is not so good at all?? So, does anyone have this tree in the collection? Or maybe seen it in shops? How does it look and feel? P.S. : I wonder why is it called a pine, if it definitely looks like a spruce/fir tree. It's definitely a spruce. Pines are hardly ever that triangular in shape. It's a very nice-looking spruce toy. Agree. I really wonder why is it called a pine. 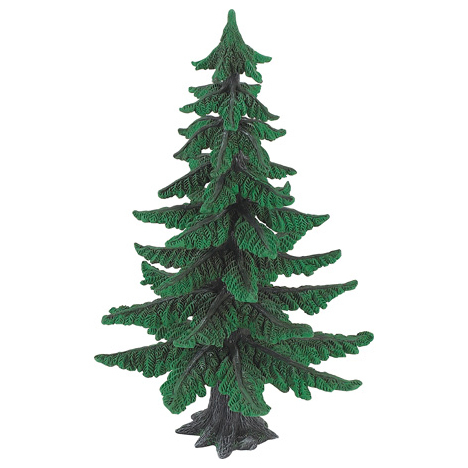 I have a little and a big Schleich Fir Trees. And I think it's a pretty nice for a tree figure. There is a difference between a fir and a spruce. If you look at branches of both carefully, you'll see that the spines are not disposed the same way on a spruce' branch and on a fir's branch. On a spruce branch, the spines are disposed all around it on a full cylinder. On a fir branch, the spines are only distributed on both sides, making the whole branch look flat. Thanks for explanation! I thought that spruce and fir were just synonyms in English. Now I've checked it up and see that these are two different genera: spruce is of the genus Picea (Fichten, ель), and firs - Abies (Tannen, пихта). I knew it because those trees have different names in french also (I'm a French Canadian who is an amateur botanist at my hours). A fir is called "un sapin" in french, while a spruce is called "une épinette". The most common fir, in my home area (Mauritie), is the Balsam fir; the most common spruce is the White spruce. CollectA has a cycad and ginko biloba trees that are great models, if you like trees, I have both, they will be used in the appropriate diorama. Yes,it can be complicated with those names of those trees! The fir is called Spar or Sparreboom in Holland,and Tanne or Tannenbaum in Germany,and this is the most common tree to use as the Christmas tree. The other one is called Den or Denneboom,and in Germany Fichte. To make it more complicated...the German Tannenbaum is the exact translation of the Dutch Dennenboom,which is actually the other species,haha. But in the famous Christmas-song we do sing ooohhhh Denneboom(and Tannenbaum in German,which is correct in this language,as they do mean the species that is used for Christmas),although we do have a Spar(fir)in our living-rooms...,strange...isn't it?